Al Shihi Finance Company established in 2002, is a lender and leading investment company having interests across various sectors including healthcare, education, infrastructure, retail, real estate, financial services, communication, power & energy and technology.A successful business needs a committed ownership, a strong business concept, and a financing strategy to help the business grow and thrive. Using your own money to finance a business is obviously the easiest approach, but this may not always be a viable option. This is where Al Shihi Finance Company comes in. For more than a decade, Al Shihi Finance Company has been providing innovative business loan products to individuals and companies. In today’s rapidly changing business environment a loan from Al Shihi Finance Company can be an invaluable injection for you to expand your operations and further your company’s ambitions. We give easy and censored loan. We have a flexible and pragmatic loan offering tailored specifically to individuals, business, entrepreneurs, private and public companies’ investment project, taxes and bills etc. Get back to us if you want to participate for more funding details. Consumers Beware: Please be on the alert for scam artists using the name, FastCash, or our website name, FastCash.org, in an attempt to defraud or mislead you. FastCash.org is not a lender and will never ask you to make a payment before issuing you a loan or for any other reason. If you receive a suspicious call or email, please contact your local BBB (www.bbb.org). FastCash.org is a lender-matching service. Our service is provided free of charge. FastCash.org does not accept payments. If you have any questions about our lender-matching service or if we can serve you better, please do not hesitate to contact us using the form below. For any questions about an existing loan, a loan application, loan terms, loan repayment or loan modification, contact your lender. FastCash.org is NOT a lender and will NOT be able to provide any information on outstanding loans. You must contact your lender directly. The Washington State Department of Financial Institutions (DFI) received a complaint from a consumer who was the target of an advanced fee scam. The consumer reported that, after he applied for several online payday loans, he began receiving loan offers over the phone. One phone call was from a man who called himself “Sean Wood.” He offered the consumer a $5,000 loan if the consumer put $250 on a pre-paid card and disclosed the card number. After the consumer did so, Sean Wood demanded payment of $125, $100, and an “insurance fee.” The consumer paid $475 in fees, but never received the loan. Two weeks later, the consumer received a phone call from a man who claimed to be Scott from Fast Cash USA. Scott offered to refund the $475 for a $108 fee. Ultimately, the consumer did not receive a refund. The phone number related to this scam is 727-575-9660. DFI has no additional information about the scam. DFI strongly recommends that consumers deal only with those lenders that are properly licensed to conduct business. Consumers can determine whether lenders are properly licensed using the “Verify a License” feature on DFI’s website at www.dfi.wa.gov. This domain server is hosting most money mule scam sites……. Record last updated on 21-Mar-2013. The Washington State Department of Financial Institutions (DFI) received a complaint from a consumer stating that he applied for a loan with Kerry & Wright Lending Group. As part of the loan agreement, he was required to send a collateral payment in advance. The consumer further alleged that he was instructed to make an additional collateral payment prior to receiving the funds, that he requested a refund, and that he has not received any response. Kerry & Wright Lending Group’s website, Kerry-n-wright.com, lists their address as 719 2nd Avenue, Suite 300, Seattle, WA 98104. However, this address does not appear to be the actual address for this entity. Phone calls to the number on the website, 866-947-7326, went unanswered. Kerry & Wright Lending Group is not licensed with DFI and is not registered to do business with the Washington Secretary of State or Department of Revenue. Kerry & Wright Lending Group does not appear to be a legitimate business. If you feel you are in immediate danger contact local law enforcement. If you feel you have been the victim of a loan scam please contact the Federal Trade Commission at 1-877-FTC-HELP (382-4357), or online at www.ftc.gov. The Washington State Department of Financial Institutions (DFI) has received a complaint from a Washington consumer, who received a “mailer” solicitation for loan modification services. The mailer does not identify the entity offering these services, only a phone number: 888-410-8098. This phone number now appears to be disconnected. 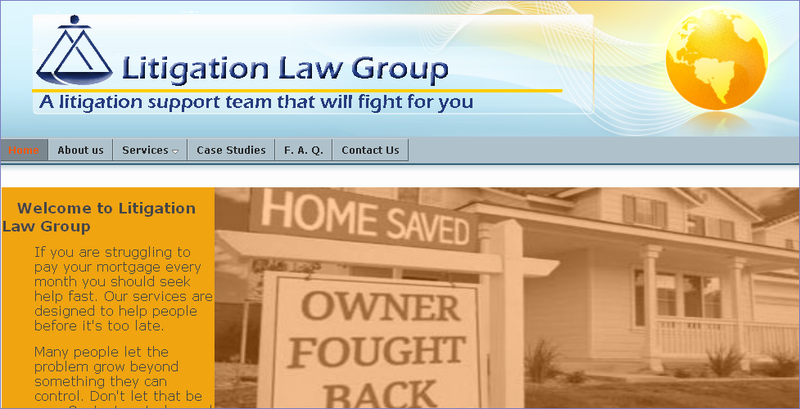 When called an individual who answered identified the name of the business as the “Litigation Law Group” located in Anaheim, CA, and provided their website as http://www.litigationlawgroup.net. The website is no longer operational, but when operational it also made reference to itself by the name of Legal Loan Review. Legal Loan Review had a website of http://www.legalloanreview.com with the same phone number as on the mailer and the same address as for the Litigation Law Group, Inc. This website is no longer operative. Litigation Law Group, Inc. and Legal Loan Review, Inc. are not licensed by DFI or registered or have an open account with the Washington Secretary of State, Department of Licensing or the Department of Review. with a Bruce Weiner as the agent for service of process. The California Secretary of State website indicates the entity is now dissolved. with a Ahmad Khatib as the agent for service of process. If you are suspicious of unlicensed activity by a mortgage broker, consumer lender, money transmitter, or escrow agent; contact the Washington State Department of Financial Institutions at 1-877-RING-DFI (746-4334), or online at http://www.dfi.wa.gov. If you feel you have been the victim of a loan scam, contact the Federal Trade Commission at 1-877-FTC-HELP (382-4357), or online at http://www.ftc.gov. If you feel you have been the victim of a loan scam involving the Internet, contact the Internet Crime Complaint Center at http://www.ic3.gov.